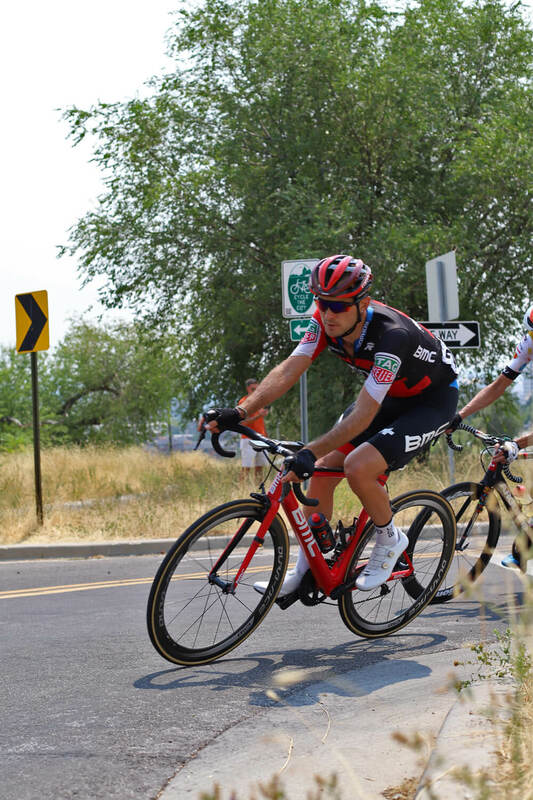 The most current iteration of the Tour of Utah began in 2000. Originally called the Thanksgiving Point Stage Race, it was a race initially open to all pro, semi-pro, and enthusiast road cyclists. Eventually, the race was was purchased by the Larry H. Miller Group of Companies. 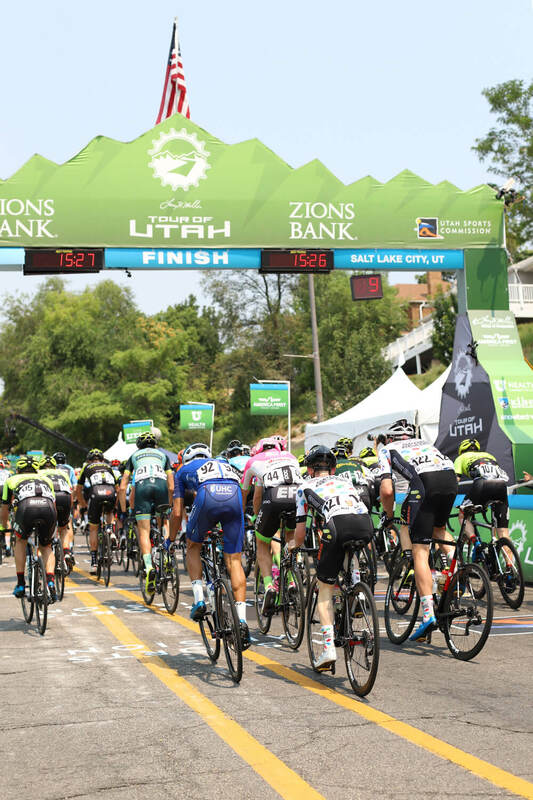 Years later the renamed Larry H. Miller Tour of Utah received 2.HC-rate UCI stage race designation, making the Tour of Utah one of the top stage races in North America. 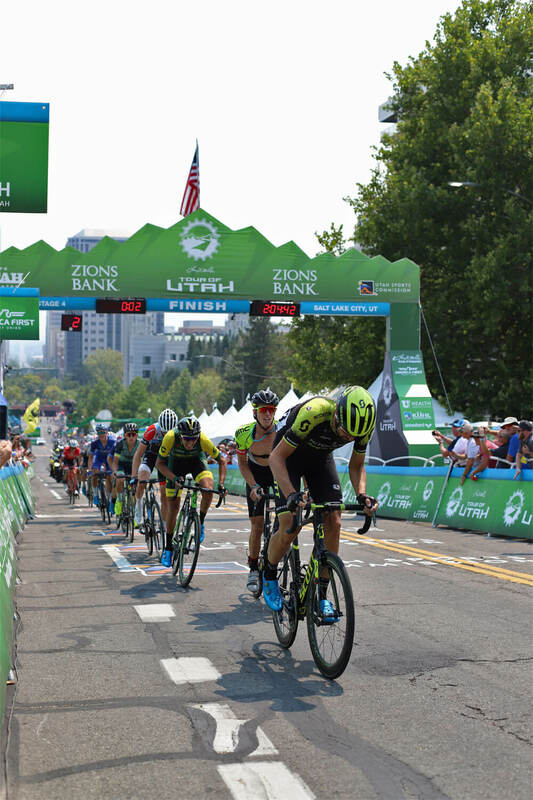 Commonly known as “America’s Toughest Stage Race”, the 2018 Tour featured five UCI WorldTeams from all around, and some seriously intense competition throughout. 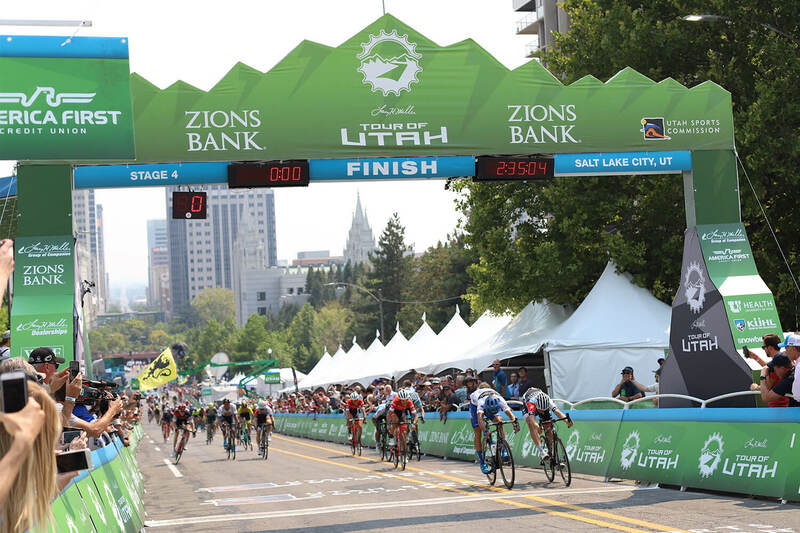 The 14th year of the Tour of Utah features six stages and a prologue, with three big mountain pass days and more elevation change than anyone has any reason to climb on a bike. This year’s TOU featured the American Sepp Kuss of LottoNL-Jumbo. Kuss won the overall by 2:09 by winning all three mountain stages. His efforts led him to support his team at the Vuelta a España to make his first opportunity at the Grand Tour. 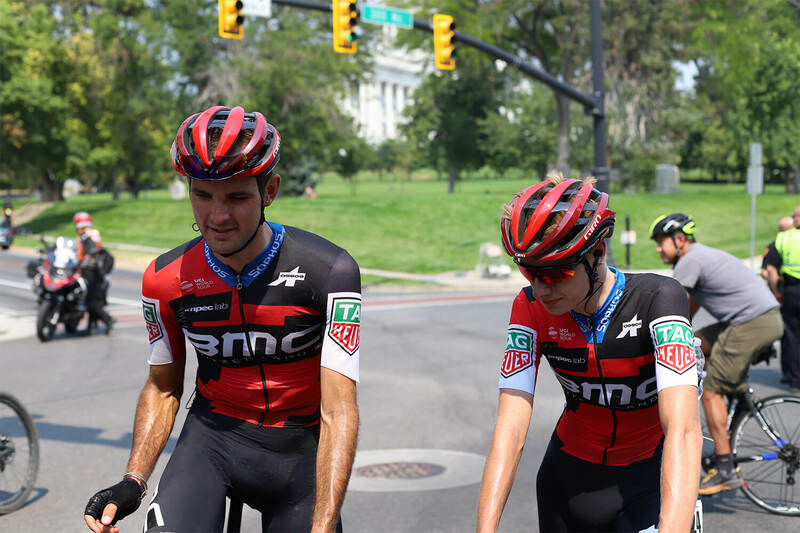 Our Words With Friends participant Brent Bookwalter (BMC Racing) showed off his strengths in this year’s TOU. 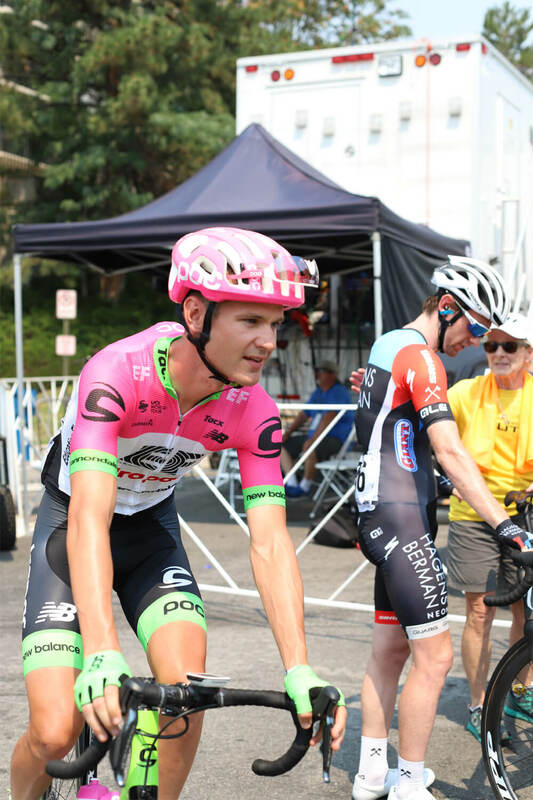 A hard-charging Bookwalter narrowly finishing second in the final stage in Park City, and fourth overall in the GC. He’ll take his talents to the Vuelta in support of Australian Ritchie Porte. 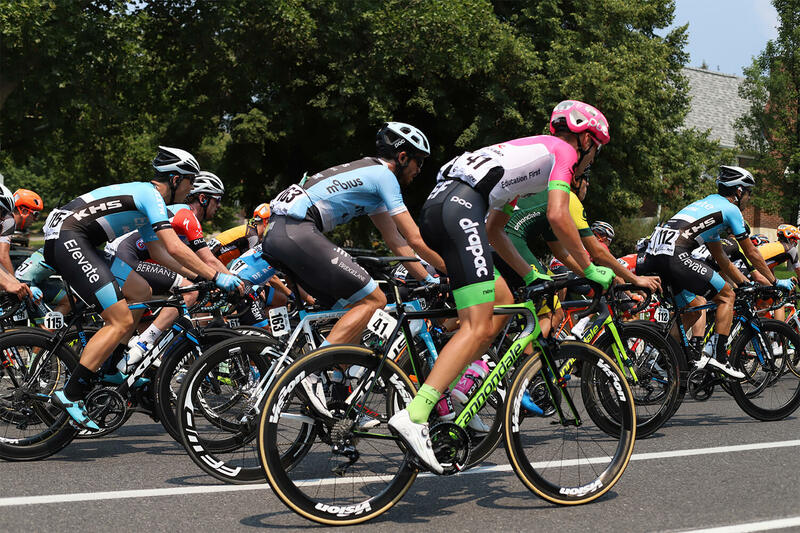 Other Words With Friends participant Nathan Brown (EF-Drapac p/b Cannondale) finished 26th, while receiving fan favorite for his always-pushing style. 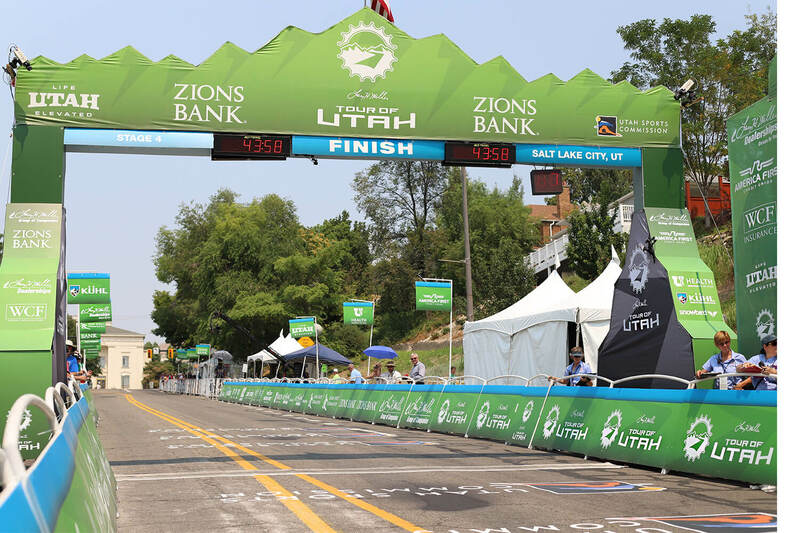 But as breathtaking as the views are, and as intense as the competition is in the Tour, the beauty of the Tour of Utah doesn’t come solely from the athletes, but from the community it encourages. Stage 4 in Salt Lake City shows off some of the very best views of our growing city. It’s climb to the Capitol, ride through the Avenues, and descent into the city is the epitome of accessibility and community. 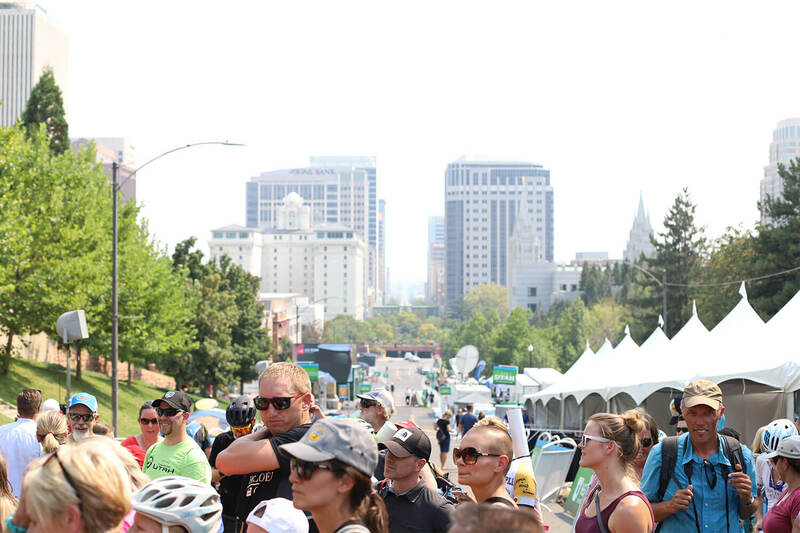 With ten laps total in the heart of Downtown SLC, there were plenty of opportunities for everyone to enjoy the competition. 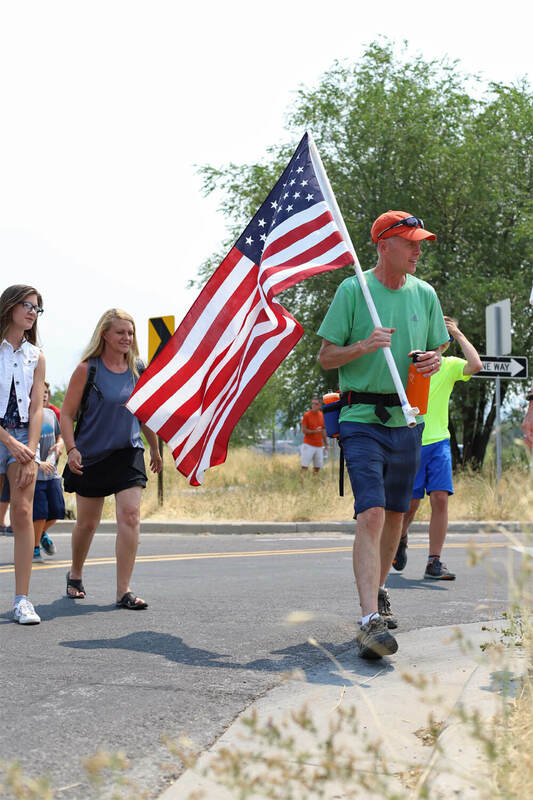 More than anything, the TOU brought out everyone of all ages, backgrounds, and creeds together on a hot summer afternoon. Few other events stoke excitement like this, and even though this was many people’s first bicycle race, the energy was truly palpable. It’s a testament to the fundamental ability cycling has to unite folks, even for just a few hours on a Friday. 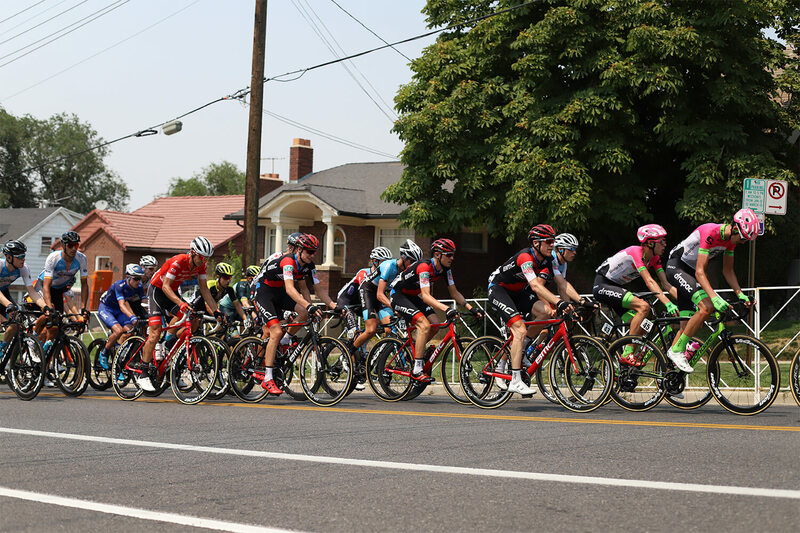 We love the Tour of Utah, and we took some photos from Stage 4 in Salt Lake City in the hopes of capturing the abounding energy. Enjoy! What do you do when riders from all over the world come to Salt Lake City? Wave an American flag at them, apparently. The one and only Nathan Brown was in the zone pre-race. We (Alvin) tried to say hello but he had a one-track mind: the heat and smoky air. The LottoNL-Jumbo team did their best to keep overall GC winner Sepp Kuss within range of the leaders. If you’ve ever walked up North Main St between North Temple and the Capitol, you know how tough this can be. And to do this climb ten times? That’s why they’re the professionals. 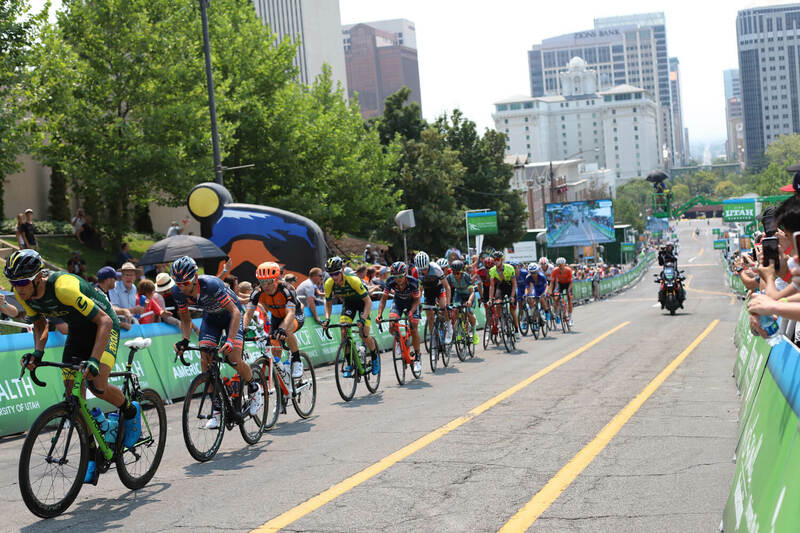 Two laps later, and the breakaway pulled away to make a 1:35 lead on the peloton. 40 minutes in, and the crowds really only came out when the peloton came by. 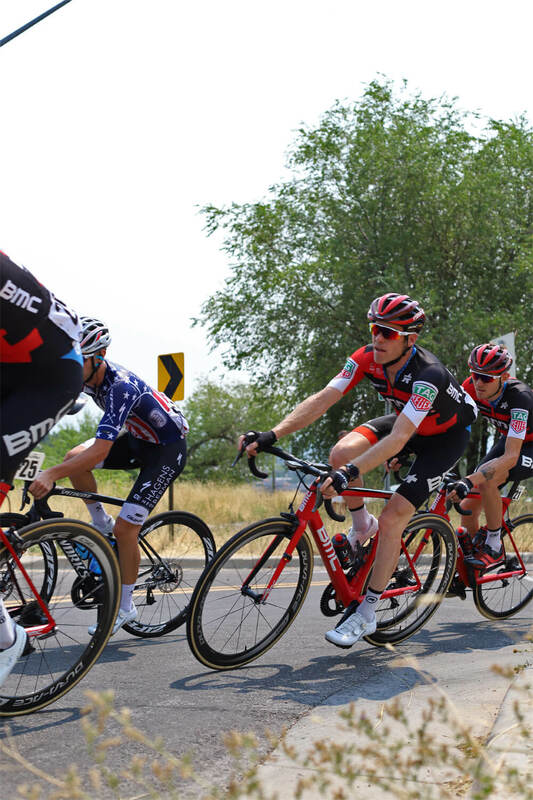 Joey Rosskopf (BMC Racing) found himself leading the break with a laser focus. Here in lap four, he took the fastest line he could. Need to know what time it is while riding in the peloton? Just ask Brent Bookwalter (BMC Racing). 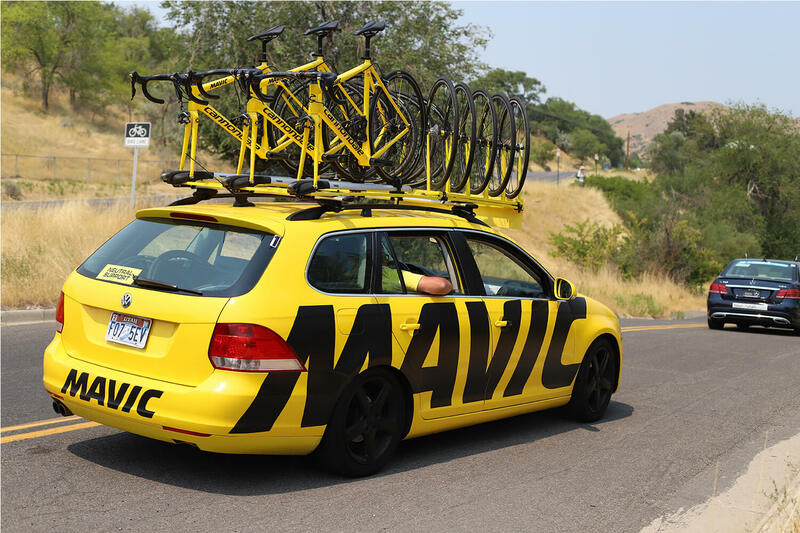 While each team has a support vehicle, Mavic’s Neutral Support car was by far the most distinctive. Like Rosskopf, it clipped the apex in search of the fastest line. 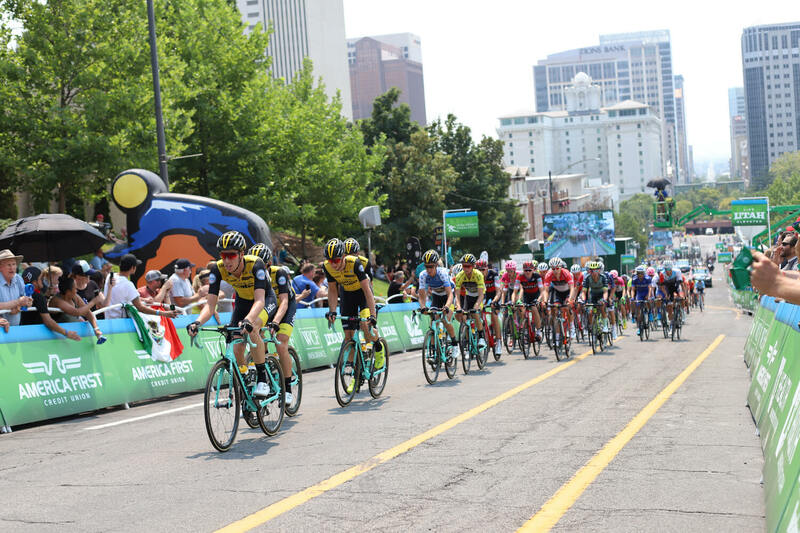 Criteriums are unique to American stage racing, but provide an excellent way to keep fans engaged in the racing. 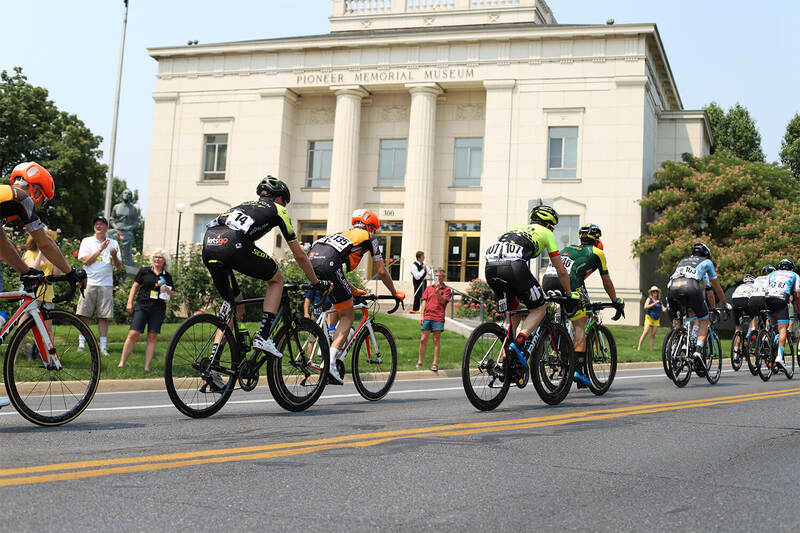 While the stage didn’t include that iconic descent south on Main Street away from the Capitol building, there were plenty of sights as racers lapped the Capitol. Driving it like they stole it wouldn’t be a fair accusation, but all of the support vehicles were at top speed going into City Creek Canyon. 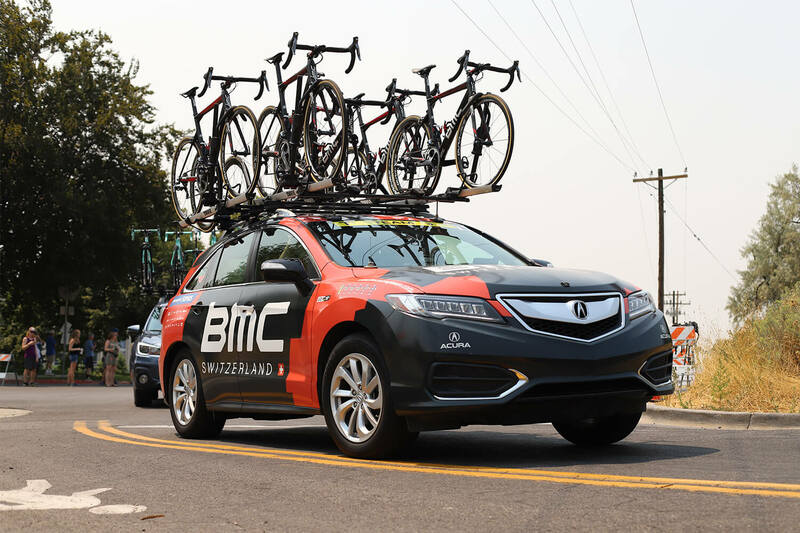 By about the seventh lap, the peloton pulled back within sight of the breakaway, with Brent Bookwalter (BMC Racing) able to pull his way up to sixth place. The peloton toward the end of Stage 4 cut that 1.5 minute deficit on the break to about 40 seconds by lap eight. Utah naive TJ Eisenhart was feeling the heat in the face of many local fans. A sprint finish. Energy in the crowd was palpable, and in the time off between basketball and college football, fans were excited. Drenched in sweat and drained from the two-and-a-half ride, riders were still surprisingly accessible to fans. 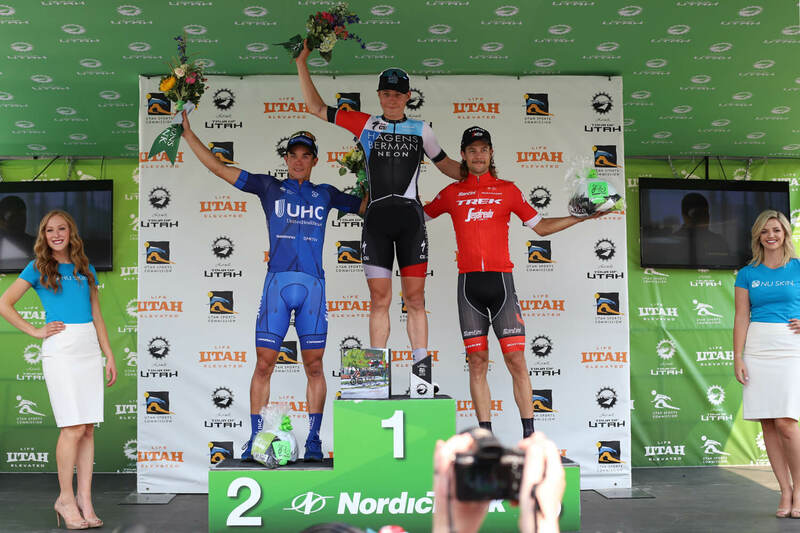 Jasper Philipsen (Hagens Berman Axeon), Travis McCabe (UnitedHealthcare Pro Cycling Team), and Kiel Reijnen (Trek – Segafredo) take the podium. 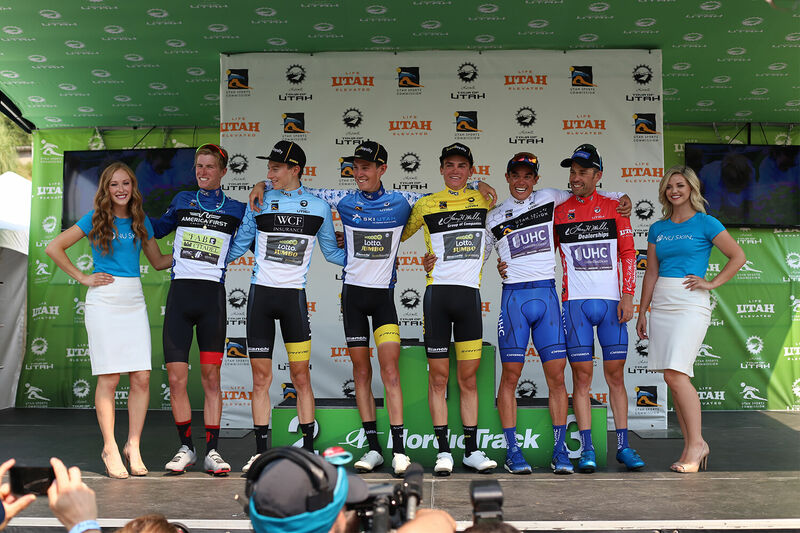 All smiles for winners of the Salt Lake stage classification winners. Even after most left, many stuck around to see the top riders off to the next stage.